To date, Senate Bill 1156 in California has been framed by the powerful insurance lobby, neglecting the horrible consequences for vulnerable, low-income patients with chronic diseases and putting insurers’ profits above the people’s needs. 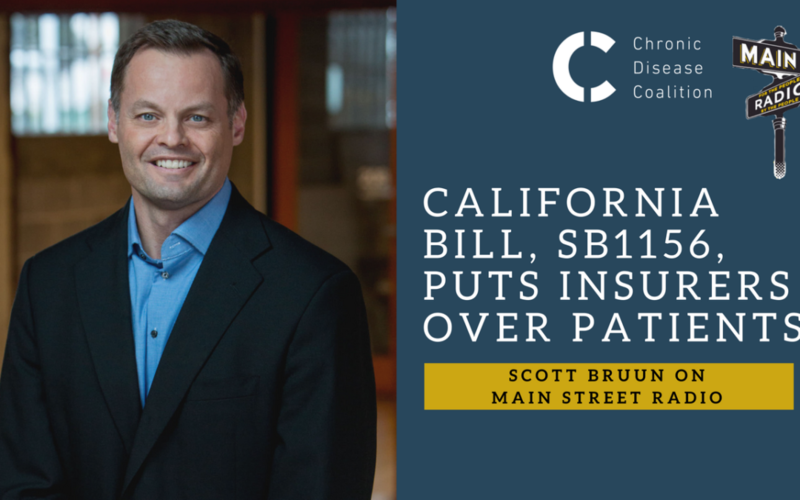 Chronic Disease Coalition Executive Director Scott Bruun recently shared the facts about this disastrous legislation on the Main Street Radio network. During the interview, Bruun explained how Senate Bill 1156 would jeopardize access to charitable premium and copay assistance for patients battling end-stage renal disease (ESRD), or kidney failure, a trend that would then spread to people with other chronic diseases and additional states across the country. In the meantime, California will see dialysis clinics close, and patients will suffer, all to benefit profit-hungry insurers. Following are four takeaways from the interview. 1. Patients across the nation have been losing health insurance coverage as health plans deny premium and copay payments made by charitable organizations. This disturbing trend forces patients off their commercial insurance and Marketplace plans. 2. With Senate Bill 1156, California insurers are focusing on dialysis patients because they are high-need, using the coverage more than their healthier counterparts. This is because end-stage renal disease requires patients to receive lifesaving dialysis treatments several times a week to filter toxins from their blood since their kidneys no longer can. But, if passed, this legislation poses major risks for other chronic disease patients as well – not just those with kidney failure. “Any chronic disease patient that may find themselves in a situation where they temporarily or whatever the case may be, need to rely on charitable premium or copay assistance, it puts them at risk,” said Bruun. 3. If passed, SB 1156 would gravely harm dialysis patients’ access to care. It will affect not only their access to commercial insurance plans but to dialysis clinics, which may close, especially in rural areas, if California lawmakers pass this bill. “Medicare and Medi-Cal just don’t pay the bills, so if insurance companies are successful in reducing the number of people on commercial insurance, it will drastically upend the dialysis world and be very hemorrhaging for patients,” Bruun said. These consequences extend to the overall model of Medicare for kidney patients. 4. Insurers are targeting an extremely small population, but if passed, this legislation would set a dangerous precedent for other states to follow. The Chronic Disease Coalition is fighting to ensure that this harmful bill doesn’t jeopardize chronic disease patients’ access to care. Patients who have been successfully paying their insurance deserve the opportunity to choose the health plan that suits their needs and their family. You can listen to Bruun’s full interview below, and you can join our efforts here.